Welcome to Shoppe LeShoc, The Official Online Source for Transylvania Television Merch, Movies, and More! DVD orders ship directly from the show's creators (!) so allow 2-4 weeks for delivery. Look for sales and special collectible items that become available periodically! Shirts and other imprint items are printed on-demand by Spreadshirt and ship separately from DVD orders. We've personally ordered many items from Spreadshirt and are always impressed with the quality, and they really last! If you want to request an item or a size that is unavailable, contact us at tvtvonline@gmail.com and we will see to it! (Approx 89 minutes) Three new episodes and a host of extras that "Really Aren't for Kids! "includes three full length episodes (The VHS of Death, Beach Blanket Kink-Oh! and Dead Man’s Party), a behind-the-scenes featurette, and the live web show “Night of the Living Web Show” starring Batfink and Von Bucket! The new episodes also feature wryly informative commentary by the show’s creators Michael Heagle and Gordon Smuder. ​$14.99 plus shipping and handling to the Domestic US only. 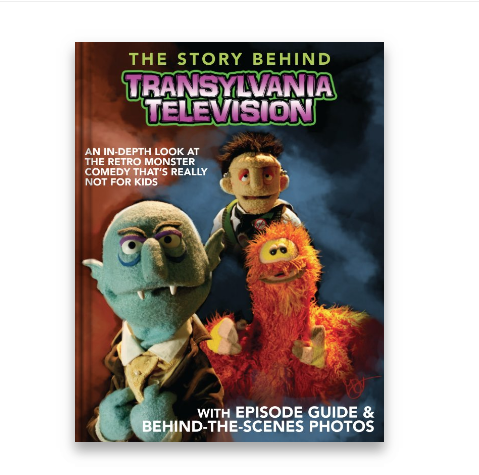 (Approx 126 minutes) This best-of video collection features five full-length episodes of the Retro Monster Comedy that's Really Not for Kids (Night of the Memotronic, Dark Night of the Ejaculatron, There's a Hell in Von Bucket, Return of the Living Night Shifts, and Night of the Thingy). Episodes also feature audio commentary by the cast, and the disc also features three bonus shorts (Hosting the Muppet Movie, Hosting the Star Wars Holiday Special 1 & 2). Join Furry and Batfink on their quest to find the true meaning of Halloween! Thrill as Von Bucket and Archie uncovered the identity of their masked party crasher! See if the Vampire Le Shoc can escape the clutches of the mummy's curse! And let Dwayne Frankenstein's story of the Pumpkin Prince warm the cockles of your heart. And pants. This is the "Extended Broadcast Cut" and at 48 minutes contains scenes not available on streaming versions of the show. ​$13.99 plus shipping and handling to the Domestic US only. Enjoy the classic catalog of TVTV on DVD for less! Get both discs shipped Domestic US for one sweet price! An in-depth look at the series via interviews with the shows creators, with full color photos and more! Look inside and see the whole thing before you buy! A very limited quantity remains of the original 2007-era TVTV Pressbook, signed by members of the cast! A unique and rare collectible for the serious fan!